An unforgettable experience going upstream the Paraná River. 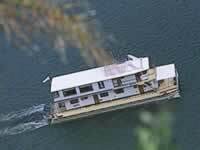 A modern craft transports the members of the expedition to the most exuberant areas of the Misiones rain forests. An unforgettable experience going upstream the Paraná River. 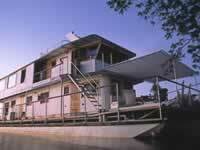 A modern craft transports the members of the expedition to the most exuberant areas of the Misiones rain forests. The refreshing areas of the Iguazú waterfalls captivate the senses. From the city of Posadas, an unforgettable expedition leaves upstream along the Paraná River on board a modern craft to the majestic Iguazú waterfalls. To go on this excursion, you should contact the people from Paraná Gypsy, who have adapted the craft bearing the same name to optimal safety standards so that passengers may enjoy the experience to the utmost. This three-deck, twenty-one meters long fabulous double-hulled boat has four staterooms, all with private bathrooms, and beautiful cedar wood decorates the interiors. On the main deck a generous walkway fore and aft offers the space to enjoy the ever changing views. 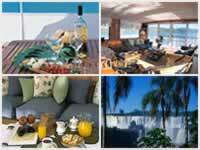 The second deck has a large and comfortable dining - living room with big picture windows, a gallery and crew quarters. On the third day, during breakfast, the boat cruises to the town of Montecarlo. Along the banks, the wild tropical vegetation grows all the way to the river's edge. 450 species of birds including toucans, parrots, humming birds and the largest of all eagles, the Harpy, inhabit the jungle all around. On this day, the ship is changed for 4x4 vehicles to go on to explore the heart of Misiones jungle. Back on board the Gypsy, on the Piray Miní stream, dinner is served in the company of the unique sunset chorus of birds. A nineteen foot skiff with outboard is available during the whole voyage for passengers to fish, explore small wild streams, experiment water skiing, ringo rides or just come and go to the towns along our cruise. On the fourth day morning, passengers are free to roam the quaint town of Montecarlo or visit the semi precious stone mines of Wanda, a short drive away. On the fifth day, the first impression caused by the waterfalls is experienced as passengers explore the rumbling waters of the Yacú waterfall. After lunch, they cruise to Puerto Iguazú. This is a very scenic stretch with dozens of waterfalls of all sizes that can be observed during the cruise. 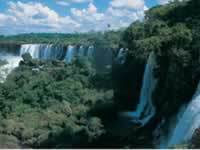 Upon arrival, the members of the expedition are lodged at the Sheraton International Hotel Iguazú, where they spend the rest of their stay enjoying wonderful sights of the Iguazú falls. The following morning, Puerto Macuco is visited. 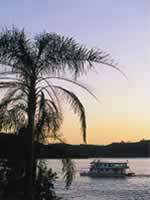 The passengers board a large Avon skiff and go upstream to an introduction of the Iguazú falls. Everything comes together there. Birds and butterflies of incredible colors, coatis, colorful iguanas and capuchin monkeys are a common sight. Miles of walkways that twist through the jungle on the Argentine side give the possibility to see the many different dramatic views Iguazú has to offer. In the afternoon, they go back to the hotel for a refreshing shower and the farewell dinner, putting an end to the fabulous expedition.